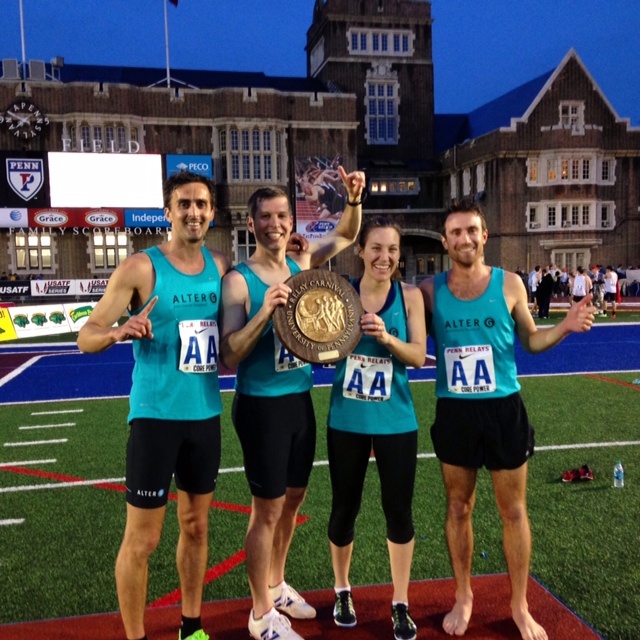 This Friday night, at the University of Pennsylvania, four AlterG employees will take the track to defend our title as the two-time Corporate Distance Medley Relay Champions. The Penn Relays, hosted by the University of Pennsylvania, is the largest and oldest track & field competition in the US. Professional, collegiate, and high-school runners compete in a variety of relay races over four days, and attendance can top 50,000 people! Companies across the US also get to display their athletic prowess by competing in the Corporate Distance Medley Relay. The event consists of four legs: 1200m, 400m, 800m, 1600m, and all corporate teams must have one woman and one person over the age of 40. Up against corporate giants like General Electric and Lockheed Martin, AlterG first made a splash in this event in 2013 by taking down the defending champion. In 2014, with some new members on the team, AlterG improved their time and repeated their victory with a time of 11:00.50. On Friday April 23, four AlterG employees, Jesus Romo, Bea Tran, Barry Heyden, and Michael Coe, will attempt to win for the third year in a row.